New refrigerators and shelves offering food items at the renovated food pantry at Catholic Social Services' Montgomery County center allow clients to choose the items they wish for their families. Core volunteers at the Catholic Social Services’ food pantry in Norristown, Montgomery County, proudly pose in the newly renovated facility. Hungry families in Montgomery County hoping to stretch their food budget now have the opportunity to choose the foods they want, just as though they were shopping in a store. 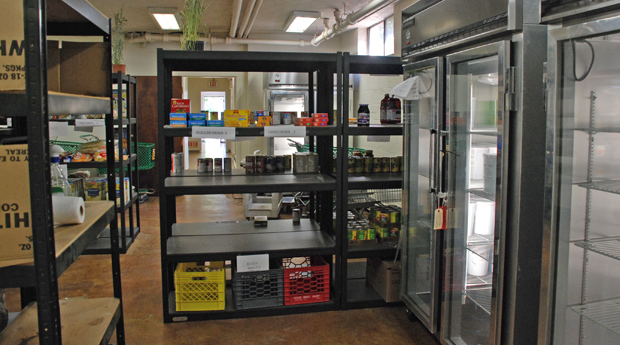 The food pantry at archdiocesan Catholic Social Services’ Norristown location recently completed a major renovation to transform its heavily trafficked site into a “Choice Market” model for individuals and families experiencing food insecurity. In just the few days since reopening under this new approach, Peteraf and Amanda Ruch, a staffer who runs the day-to-day operations of the pantry, have observed how it fosters “people interacting with and engaging one another as persons, and tears down the walls between us as clients and staff or volunteers,” Peteraf said. The new initiative at one of the largest food pantries in the region was made possible by the generosity of two major donors. The Federal Association of the Order of Malta, a Catholic lay organization dedicated to service and charitable work, provided a $25,000 grant to purchase glass-door display case refrigerators and freezers. 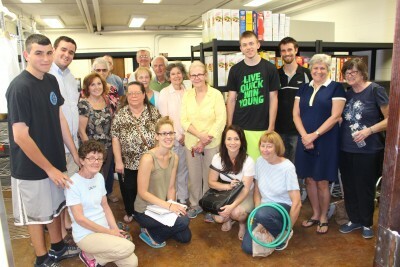 The coordinator of the local branch of the group Clair Raubenstine and his wife Jeanne, also a member of the order and long-time supporter of Catholic Social Services, initiated the project and identified the food cupboard as a hands-on local service project for the order’s local members who assist there on monthly basis. Local members Karen and John Hoy were instrumental in writing the grant and presenting it to the Federal Association’s Board of Directors. “The Food Cupboard’s program does great work on a small budget, so funds for this equipment will enable it to better serve its clients,” said Hoy. In addition, the North Penn Community Health Foundation supported the effort with a $10,000 grant to hire a consultant to coordinate the efforts of contractors and volunteers. Tom McGlynn, a young Catholic parishioner from Visitation B.V.M. in Norristown and small business entrepreneur, served as the project manager for the renovation. From moving out existing food inventory to demolition and subsequent rewiring and reconstruction, and finally painting and restocking, the project was a packed eight days of intense work from early morning to late evening. Peteraf cited a group of over 50 dedicated volunteers who worked diligently and adeptly alongside contractors to complete the major work in just one week. Some volunteers were relative newcomers but most were members of a “CSS Montco” volunteer corps that numbers about 65 monthly and over 200 in total. Most come from area Catholic parishes: St. Paul in Norristown, which provides space on its campus to the CSS Family Service Center and food pantry; St. Genevieve in Flourtown; St. Titus in East Norriton; Visitation B.V.M. in Trooper, near Norristown; St. Helena in Blue Bell; Epiphany of Our Lord in Plymouth Meeting and Mother of Divine Providence in King of Prussia. Some volunteers that Peteraf called out for special recognition include Maureen Connell, John Friede, Denise Janick, Eileen Gajewski and Maria Wilkerson, all of whom “were there literally day and night all week,” she said. In just the first three months of this year, the food pantry distributed 150,353 pounds of food to 2,327 households, which represent 8,202 individuals served. The pantry as it was known, and now the “Choice Market,” depends on the volunteers to carry on weekly operations. All volunteers are cross-trained so that people can fulfill a variety of roles, ensuring that all who serve are careful about how services are delivered. Jim Drea, a St. Paul parishioner, is the longest serving volunteer who specializes in recruiting and coordinating volunteers, as well as cultivating and maintaining good relations with the various grocery stores that donate food to the effort. Tom Boyle from Mother of Divine Providence Parish does “whatever needs to be done” according to Peteraf, including being ready “at a moment’s notice” to go and pick up food from local grocers who donate their overstock meat and produce. Many young people have also gotten involved, some through local scout troops or parish youth groups, and others through local colleges like Ursinus College, whose “Bonner Grad Scholars” serve at the pantry as part of their scholarship requirement to engage in local community service. CSS is fundraising for various projects to support the work of the pantry, and there is a “Go Fund Me” page set up for those who would like to donate. Those with questions about benefiting from the food pantry, or to volunteer for it, may contact Peteraf at CSS Montgomery County at 610-279-7372. The CSS Montgomery County Choice Market is open four days a week to any individual or family who is not able to meet their monthly food needs without assistance. Hours of operation are Mondays 9-11 a.m., Wednesdays 5-6:30 p.m., Thursdays 9-11 a.m. and 5-6:30 p.m. and Fridays 11 a.m.-12:30 p.m.
Can Tom McGlynn come to my house and straighten my shelves? Kudos to all involved. Good work should always be acknowledged. Your all the best!